THE SEARCH FOR THE OCEAN’S SUPER PREDATOR (1 x 60’ HD) is the story of a super predator’s epic underwater attack that leads investigators to an aquatic battle zone. 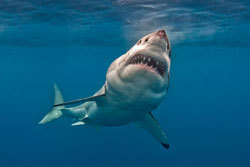 What sea creature could hunt down and devour a three-metre long great white shark? GLOBESITY (1 x 55’) exposes the shocking explosion of global obesity in places where just a few decades ago hunger was a headline health concern. From China, where the consumption of sugar and oil has led to an exponential expansion of waistlines; to Brazil where global food companies have fundamentally altered traditional diets; to India where it’s predicted 100 Million people will soon be suffering diabetes and on to Mexico, the biggest consumer of soft drink in the world, where diabetes is already the number one killer. Two programs at MIPCOM feature the champion racehorse, Black Caviar, who took on Europe’s best at Royal Ascot and won, bringing her unbeaten streak to a total of 22 races. TO SET BEFORE A QUEEN (1 x 28’) tells the fascinating inside story of the making of Black Caviar, stretching back across the generations, while PAINT THE TOWN BLACK (1 x 26’) goes back to where it all began on a stud farm and observes how Black Caviar has transformed the lives of everyone involved. THE SWIMMER (1 x 58’ HD) tells the story of Australia’s most successful Olympian, Ian Thorpe, and his attempted comeback to competitive swimming - his goal, victory at the London Olympics. This insightful program reveals the inner struggles of Ian Thorpe not just to swim fast but to rewrite his sporting legend, re-engage with the public and discover a different relationship with the water itself. Continuing with the sports programming, SPORTING NATION (3 x 55’ HD) looks at how Australia came to take its sport so seriously and what it means to be a sporting nation that is recognised worldwide. The series celebrates Australia’s sporting achievements, examines the passion of spectators and looks at how sport has shaped Australia as a nation. WORLD ON WHEELS (6 x 30’ HD) follows two motorcycle tour guides as they take fellow bikers outside their comfort zones through some of the most awe-inspiring places on Earth.